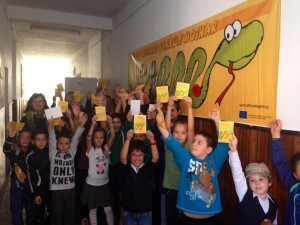 In Romania, the Traffic Snake Game campaign took place during the European Mobility Week, between the 22nd of September and the 3rd of October in 13 cities: Aiud, Alba Iulia, Bistriţa, Braşov, Făgăraş, Focşani, Giurgiu, Iaşi, Mizil, Moineşti, Odorheiu Secuiesc, Râmnicu Vâlcea and Săcele. In total 56 schools participated with approximately 7.500 children reached. OER (Energy-Cities Romania is a non-profit NGO organisation, gathering 34 members, important municipalities interested in improving energy efficiency in their public services and in promoting renewable energy and environment protection) is the national focal point for Romania and responsible for the organisation of the campaign. flash mob to launch the campaign etc. 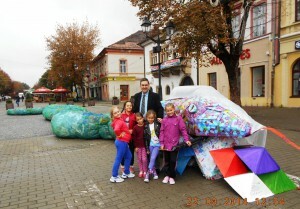 During the campaign, OSCAR, the Romanian Traffic Snake has been created in different versions: made of vegetables in some schools, of recycled plastic bottles in other schools. As well, TRAVIS the Travelling Snake visited some schools and offered the children postcards with the salute of each country involved in the campaign, asking them to send it to a close friend in order to tell the story of the game and their experiences. Some of them decided to send their postcard to OSCAR, to let him know what great results they achieved while playing the Traffic Snake Game. At the end of the campaign many municipalities organised TSG ceremonies, where children were given sweets and candies as well as diplomas for their activity, and the teachers received flowers and certificates for their involvement in the campaign. Most of the schools, teachers and children were very pleased and inspired by the TSG campaign. They can’t wait to play it again next year! There were many cases in which schools reached almost 100% sustainable trips and this is fantastic news. More information about the Oscar, the Romanian Traffic Snake, can be found on the national pages.